Get access to the full version of the latest release of OrCAD electronic design software solutions for free, including OrCAD Capture CIS, OrCAD PSpice Designer, OrCAD PCB Designer Professional, OrCAD Sigrity ERC, and more. Download OrCAD Free Trial now to see how OrCAD can help you boost your creativity, productivity, and plain old getting things done. Your business is unique, and your needs change over time. You don’t want to pay for technology you don't need, but you do want all the technology you do need. OrCAD is the only fully scalable PCB design platform in the market. You can get the functionalities you need now, and easily upgrade later when your design complexity grows. As engineers, we try our best to avoid design errors as we know how painful, time consuming and frustrating it is to fix errors later in the design process. What if we could stop fixing mistakes, what if we stopped making them? The powerful constraint-driven PCB design flow of OrCAD helps you identify the design errors in real time, so that you can get your design right the first time. Optimize your circuit’s performance and explore "what if" scenarios so you can get it just right. You can simulate complex mixed-signal designs, containing both analog and digital parts to support models like IGBTs, pulse width modulators, DACs, and ADCs. Once your design is functional, you can use the PSpice Advanced Analysis to improve the overall cost and reliability. Easily reuse or retarget proven circuitry from the same design or across designs to save time and avoid errors. Route faster and more accurately with advanced OrCAD PCB routing technologies. Find and correct DFM issues during the design process and manage manufacturing rules in the familiar constraint manager. View and analyze designs in 3D, cross probe between 3D and 2D views, and check collisions in 3D. I'm new to OrCAD, and I have questions and need information for running the OrCAD products. How can I get some help? There's lots of learning materials and documentation available from within OrCAD. From the Start Page, you can access the Learning Resources that include a tutorial to walk you through the complete Capture flow. 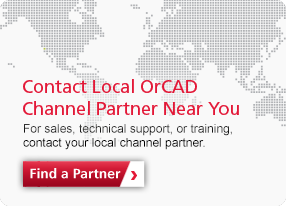 And our global OrCAD channel partners will be happy to help you with your questions during the trial process. Do I need internet to use OrCAD Trial? You don't need to have internet access when running OrCAD, but an Internet connection is required to download and install. Can I reassign the OrCAD Trial license to my colleagues? Your colleagues and friends can download a free trial from OrCAD.com, but you can’t reassign your trial license. The paid version of OrCAD allows for flexible license sharing options. How long does the OrCAD Trial installation take? Depending on your internet speed, the OrCAD Trial installation might take just a few minutes. For the best experience, a high-speed Internet connection is recommended.